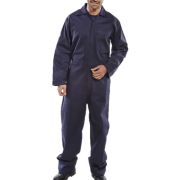 FR Regular Boilersuit 300 gram 100% cotton drill fabric with flame retardant treatment. Conc.. Regular Boilersuit 65% polyester, 35% cotton Concealed stud front 2 breast pockets Elast..